You can. Stories are bacon for speeches–they almost always make a speech better. My wife brought home the bacon today, in the form of some new sandwiches from Sonic. That got me to thinking about the explosion in popularity of bacon. Just look at how many menu items now include it, despite America’s fear of fat. 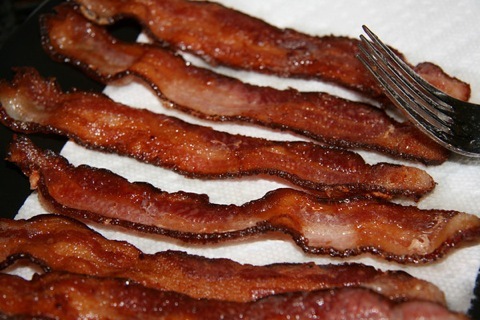 I used to date a woman who was a vegetarian–but she made an exception for bacon. Another professor at my college likes bacon so much, her middle name on Facebook is Baconator. If you feel as if your speech doesn’t have enough flavor, there are a lot of ways to boost its appeal, but some are more difficult than others, and may be iffy with certain audiences. A well-chosen story is both safe and effective. However, it’s possible to ruin something with bad bacon–overcooked, dried out, too hard to chew. And a story badly told won’t help your speech. Does the story involve a character or characters the audience can identify with? Does the hero face an interesting challenge? Does the hero change and grow as a result of facing the challenge? Do you use dialogue and scene-setting so the audience can experience the story? Bonus: does the audience find the story to be funny? It’s OK if they don’t laugh as long as the story serves to prove or clarify a point. If they laugh, though, they’re more likely to understand and remember your point. What have you learned about choosing stories to add delightful flavor to your speeches?